Please note these camera products are for environmentally demanding applications. These products, documentation, services etc. are created for use in heavy industrial process facilities primarily for viewing process applications to assist plant operators. 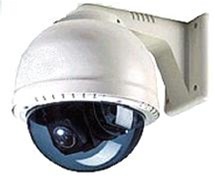 All products are built to meet industrial standards and needs and to sustain environments normally destructive to common security camera products. *Free consulting is available from the factory for all industrial camera applications. Contact us for more information. 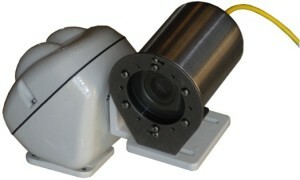 MPT3 Series Pan/Tilt with Stainless Steel SE-2012 camera. Industrial, steel geared pan tilt. Bass Electronics MPT3 Series Pan/Tilt Units, shown here with Bass Electronics SE camera attached, are ruggedly built to deliver reliable service for extended life in rigorous, outdoor conditions where dome PTZ systems may fail due to high vibration. MPT3 Series units can pan 330° and tilt ±180° from horizontal. Contact us for more information. The Bass Electronics remote controlled PTZEX Explosion Proof Pan & Tilt Camera Package is designed to meet the high demands of Classified HAZARDOUS AREA industrial environments. Package meets Class I, Groups C and D; Class II, Groups E, F and G.
Shown above is the standard camera/zoom-lens/pan/tilt unit. A complete system consists of this package along with remote controls system and monitor. Systems can be single or multiple camera systems. Controls and video can be transmitted over copper cable, fiber optic cable, CAT 5/6/7, wireless and or other methods. Cabling systems are defined by consultation with the user and the Bass Electronics team to meet any site conditions. Contact factory for assistance with your application…. Contact us for more information. 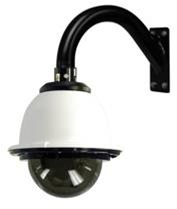 Accessory mounts are available to allow the PTZ unit to attach to vertical surfaces, poles, ceilings, beams, etc. 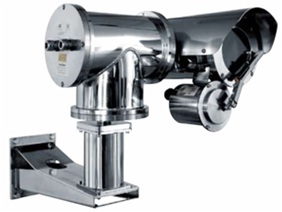 Bass Electronics MPT4 Series Ultra Corrosion proof 316 Stainless Steel Pan, Tilt & Zoom System shown with stainless steel pan tilt, camera enclosure, sun shroud, wiper assembly, wall arm mount and pedestal mount. Components are IP66 rated and manufactured form 316 stainless steel alloys for the ultimate in corrosion resistance. Zoom and fixed lens versions are available. Contact us for more information. 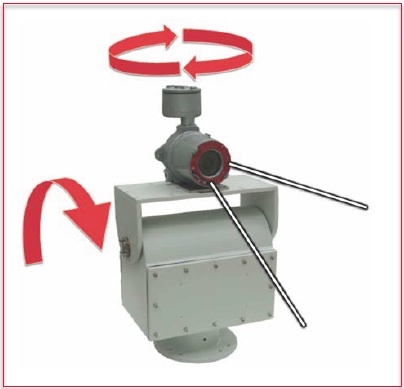 Bass Electronics DGTPZA-422 & DGTPZD-IP Industrial Pan, Tilt & Zoom Domes are pressurizable to protect internal components from dust, moisture, corrosive gasses, etc. 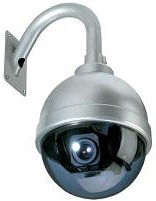 Systems include fully integrated day/night IR sensitive cameras with 36X zoom and integral receiver/drivers. Dome versions available having IP wired and IP wireless communication as well as fiber optic and also conventional copper wire for controls and video. Dome versions also available for hazardous areas. Contact us for more information. Bass Electronics DPTZCI1 Indoor Domes include an indoor camera with pan, tilt & zoom features built into an attractive package. Indoor domes mount easily to walls or other vertical structures. Contact us for more information. Bass Electronics DPTZC02 Outdoor Domes with installed pan, tilt & zoom cameras are equipped with a heater and blower for cold weather operation, perfect for many industrial monitoring applications. Contact us for more information. How are you related to the plant/facility with the camera application?